In the four-minute video, Chow Chun Fai [art]attack 6, Hong Kong-born artist Chow Chun Fai shares his views on the ever-evolving interpretation of art and his own role as an artist. A graduate of the Chinese University of Hong Kong‘s Department of Fine Arts, Chow is currently an active member of the Fotan art community, working primarily in Hong Kong and Beijing. His works have been exhibited in Hong Kong, Beijing, Shanghai, Singapore, Manchester, Munich, Salzburg, Vienna, Palermo, and Verona. In his “Painting on Movie” series, Chow appropriates stills from popular cinema. Through the remaking process, the artist explores the differences between his own understanding and the audience’s interpretation. …everyone has his or her own interpretation of things. Sometimes even the artist’s interpretation of his or her own artwork can change over time. 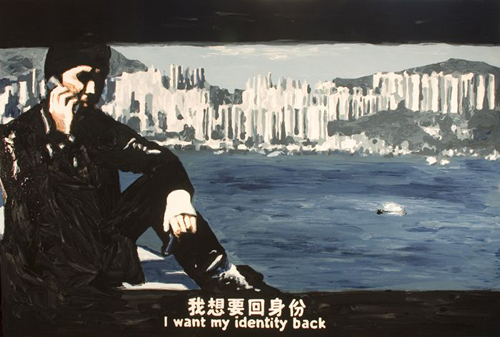 Chow Chun Fai, 'Infernal Affairs, “I want my identity back”', 2007, enamel paint on canvas. There are many scenes in this movie that cannot be translated, but you would still understand the movie regardless of your cultural background. …your work needs to involve more than just creativity. You might also need to be your own agent and writer, etc. Sometimes you can love what you do. Sometimes you get confused… I believe in everything I do. Watch the video on the ChooChooTV show [art]attack (length of video, 4:09 mins). Fo Tan is a place that you might not be able to name straight away when speaking of Hong Kong’s local art. However, this fading industrial district is home to more than 50 art studios and 180 artists. Each year in January many of Fo Tan’s artists invite outsiders into their studios to show their work as well as to exchange ideas and dialogue. Fotanian Open Studio Programme 2010 which showcases artwork of a multitude of media, including paintings, sculptures, ceramics, mixed media, printmaking, installations, photographic and video works, is the eighth incarnation of the event. This year CNNGo takes a peek inside some of the studios and interviews the artists about their experience of Fotan. 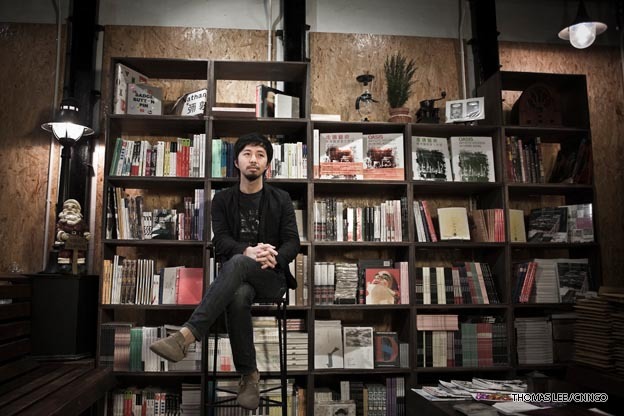 Sculpture and furniture designer Homan Ho is sitting in front of the bookshelf he made for G16, the unofficial café of this year’s Fotanian event. If you were not able to visit during the open studio event and CNN’s report is not enough for you, you can arrange your own visit at any time during the year by taking a look at the website Fotanian.com. Here you will find a map and a complete list of artists, the location of their studios and contact details. Flu Season – Artforum – 24 May 09 – Must read – This gossip column-style drily written piece, complete with photos of Asian art scene-shapers, takes a comprehensive look at most aspects of the fair: management (white plastic and undrinkable wine), gallery sales (“Art HK winners: major Western galleries, local Hong Kong galleries. Big losers: major mainland galleries.”), the parties (one a victim of its own exclusivity) and the panels (a big thumbs up). Not much written about the art itself though. Art market reporting is notoriously conflict-ridden. Business class tickets and VIP jollies for journalists are not unknown and big ad bucks in harsh economic times also make a potent lure for bias. There is not much evidence of (or opportunity for) independent research: most of the hard data about sales and visitor numbers comes from galleries and event promoters who have an inherent commercial conflict. Now that the ‘blog reader beware’ warning is done with, grab a handful of salt and enjoy the read. There is some interesting coverage of lesser known Asian-based artists by the New York Times and read (the more honest??) comments by the Asian galleries about sales which are at odds with those of the Western galleries – this is covered in several of the pieces. Overall the reviews are mostly positive (of course) but for what it is worth we thought both the art and the fair management were excellent in this second edition of the show. Art fair saw 31% rise in visitors and several major sales – South China Morning Post – May 20 09 – Gives details of visitor numbers (sourced from the fair managers) and specific big sales claimed by Western galleries and Western artists. A Korean gallery reported few sales. An artistic quest in high gear – International Herald Tribune / New York Times – May 20 09 – Must read – Interesting piece with a focus on the art on display, with a refreshing emphasis on lesser known Asian artists such as Konstantin Bessmertny, a Russian artist based in Macau. Several images. More art, better art, riskier art at Art HK 09 – Art Radar Asia – May 19 09 – Report on visitor opinions of the fair this year, gallery sales (weak for lesser known and Asian galleries), the management of the fair (better) and quality of the art. Artist makes sure fair goes with a bang – South China Morning Post – May 20 09 – Short piece about avant-garde artist Chow Chun-Fai’s 2 performance pieces hosted by Shanghai Tang. Asian auction houses starting to come of age – South China Morning Post – May 17 09 – Brief piece about auctions staged to coincide with the Hong Kong art fair (Est-ouest Auctions and the inaugural Asian Auction Week – a joint auction by Korea’s K Auction, Japan’s Shinwa, Kingsley’s from Taipei and Larasati from Singapore). The second edition – Financial Times – May 16 09 – Describes art on sale and sold half way through sale. Solid start to Hong Kong art fair despite downturn – Reuters – May 16 09 – Brief report on ‘notable sales’ in fair’s first days – This Uk edition focuses on sales (at the top end with values at tens and hundreds of thousands US$ per piece) of Western artists by top London and New York galleries including Damien Hirst, Gilbert and George, Julian Opie. Opening HK art fair – Arrested Motion blog – May ? 09 – More than 80 images of works on show at the fair – Unfortunately not tagged but it gives a flavour of what exhibitors have brought. Art HK 09: Hong Kong International Art Fair has a good start – Artdaily – May 15 09 – List of artworks sold on first day – Reports ‘robust sales’ and a ‘heady atmosphere of excitement’. Sales by Damien Hirst, Gilbert and George, Kohei Nawa, Fang Shao Hua, Ron Arad. Hong Kong Art Fair Part 11 – Illustrator James Feldman blog – May 15 09 – Acerbic blog piece about weak and strong art at the fair – Baselitz and Schnabel stand out against bloated ‘reverse engineered Botero’ sculptures. Hong Art Fair Part 1 drily discusses the pecking order of tickets – ‘I have a pink ticket and a black ticket and I can’t work out which is more exclusive’. Tennis art at the Hong Kong International Art Fair – NY Times Globespotters – May 14 09 – Short feature about live demonstration of Martina Navratilova creating one of her tennis ball paintings – She has been making these with fellow Czech and artist Juro Kralik since 2000 but has only recently started to sell the works. Strange Hong Kong art fair – Detroit Free Press – May 13 2009 – A set of 6 images, mostly sculptures at the fair and the concurrent Seoul Auction. Artists Mu Boyan, Yi hwan Kwon, Yayoi Kusama, Damien Hirst, Lin Yilin. Insider Art Fair – Artinfo – May 13 2009 – Short list of artists’ works and prices brought to the fair by leading galleries. Much of the prefair coverage republishes the press release or gives other repetitive promotional content. A couple of links covering the basics are given here and a more complete list can be found on the Hong Kong art fair site. Magnus Renfrew on ArtHK09 – Artinfo – May 12 2009 – Pre-fair interview with director Magnus Renfrew. Great questions, predictable answers. Content is mainly promotional but does cover failure to get sponsorship this year. Claims Hong Kong is superior location in Asia for art fair: well-positioned geographically to tap mature collector groups in Taiwan and South Korea as well as latent potential of future Chinese market; tax benefits. Gallery mix is 65% Asian, 35% international. MR also claims that HK art fair is more regional than competing fairs. Hong Kong’s contemporary art fair – Financial Times – May 9 2009 – A somewhat promotional pre-fair piece which lists participant galleries and side events. 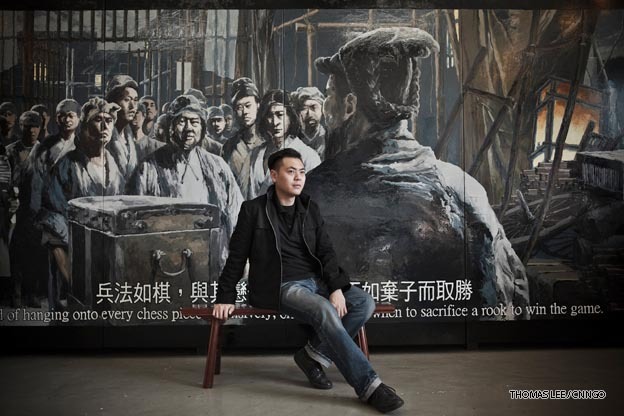 Based on a news angle which suggests Hong Kong (and environs) is a rising star in Asian art scene. Evidence for its growing importance as a cultural hub is given as 1) Guangzhou Triennial “widely considered China’s most important art event” 2) last year’s budget approval by HK government for the development of West Kowloon cultural district – a 40 hectare site for the arts 3) Hong Kong has become third largest art market by auction sales in world 4) last year’s introduction of ArtHK, Hong Kong art fair. The Spring 2009 sale of contemporary Asian art saw Sotheby’s present a collection of 8 Hong Kong artists. This is the first time that any auction house has offered a series dedicated to Hong Kong art in a contemporary art sale. 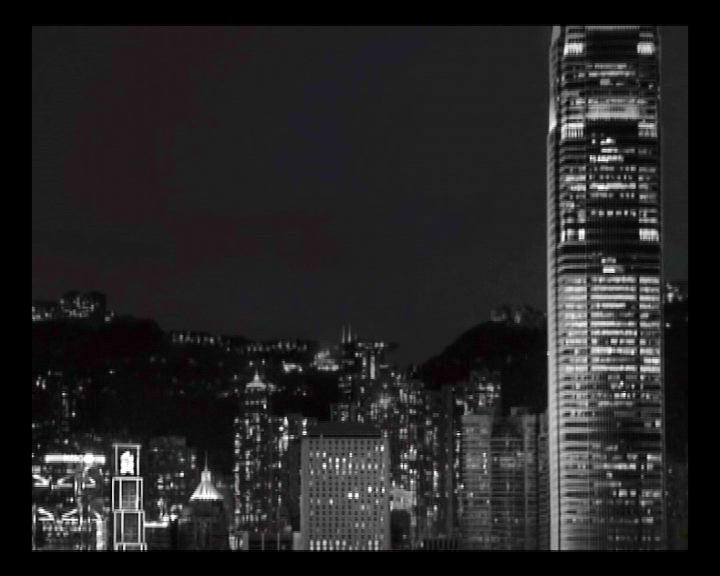 The artworks are concerned with significant historical Hong Kong events including the 1997 Handover of the British colony to China, the 2003 SARS epidemic and the annual July 1st protests as well as the experience of living in Hong Kong’s cramped urban cityscape. All of the lots were sold at estimate or more. Kum Chi Keung, Kevin Fung and the Kowloon Emperor achieved sale prices which were double or several multiples of the estimate. Kum Chi Keung (b 1965) was initially a practitioner of Chinese traditional ink painting but then extended his practice to installation art which featured his favoured motifs of a birdcage and flight. He uses these ideas as a metaphor for not only the scarcity of space in Hong Kong but also for the idea of the 1997 Handover of Hong Kong from British colonial rule back to China when many locals emigrated or obtained foreign passports. Estimate HK$55-65000 excl premium and HK$127, 500 incl premium. Freeman Lau (b1958) is a renowned designer as well as artist and uses the chair as a symbol in his practice to represent ‘place’ and ‘power’. In 1998 after the Handover Freeman Lau took a heap of standard chairs used by the colonial government and at the Fringe Club’s Out of Chaos, the Search for Position 11 arranged them in a haphazard wall. This represented not only the power of the colonial government but the disorder and confusion of Hong Kong’s inhabitants. The SARS epidemic of 2003 was a monumental influence on Man Fung Yi‘s practice. That year her younger sister’s life hung by a thread after contracting SARS and being forced to abort her 27 week old fetus. Earlier in 2001 when she herself was pregnant using lit joss sticks she singed holdes into silk cloths and created patterns as a form of prayer. She re-enacted the ritual as an expression of gratitude when her sister regained her health. The arrangement of embroidery-like holes has become an abiding motif in her work. Kevin Fung, Lik Yan (b 1964) has been an apprentice of Hong Kong artist woodcarver Tong King Sum since 1993 and his work expresses the stress and suffering of living in Hong Kong’s cramped urban spaces. His Baggage Series was selected for the 15th Hong Kong Art Biennial and is in the permanent collection of Hong Kong art museum. Estimate HK$80-100,000 excl premium, sale HK$212,500 incl premium. Chow Chun Fai (b 1980) excels at capturing unnoticed details of Hong Kong daily life in his work. 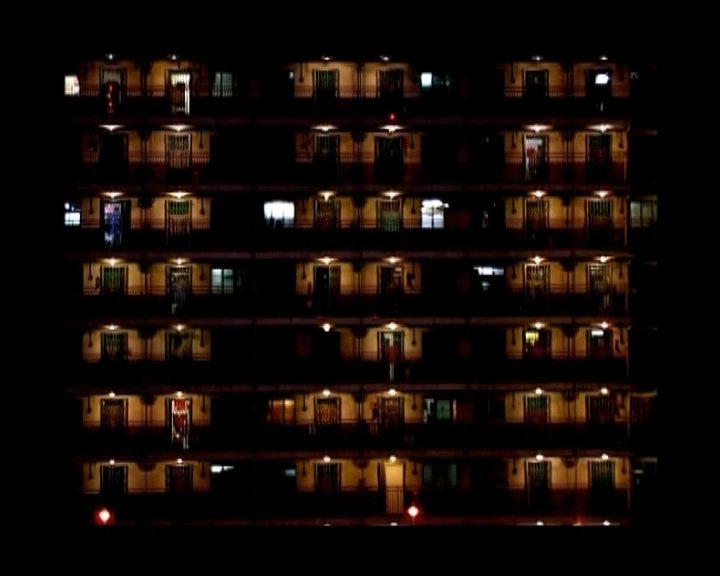 In his Painting on Movie series he appropriates images from Hong Kong movies. Anothermountainman Stanley Wong, Ping Pui was selected as one of the representatives of Hong Kong art at the 51st Venice Biennale of 2005. He is an accomplished creative director of advertisements as well as films. In 2000 he began incorporating red, white and blue nylon fabric in his works, a material which is ubiquitous in Hong Kong and used in a variety of ways from covering buildings under construction to creating bags. This durable fabric represents the spirit of the Hong Kong people: versatile and resilient. John Fung, Kin-Chung is a photographer who produces photographs of iconic urban vistas which include Hong Kong’s skyscrapers and the Mid-levels escalator which is the longest outdoor escalator in the world. He manipulates the images to create disjointed kaleidocopic patterns representing the discomfort and sensory overload of living in Hong Kong. Source: Sotheby’s catalogue Contemporary Asian Art April 2009 Hong Kong. The Sovereign Asian Art Prize carries a first prize of US$25,000 and is in its 5th edition. This time the acceptance criteria have been broadened from all forms of painting to all forms of 2D media. Thirty finalists have been selected by a panel of experts from 1000 entries. A public prize is also awarded to the painting which receives the most votes from the public who attended the exhibition or cast their votes on the website. The culmination of the prize is a public auction where it is hoped that funds will be raised to support charities and a ‘first of its kind in Hong Kong’ three year residency programme for international artists. Judges are Uli Sigg (collector) Peter Aspden (Financial Times critic) Pamela Kember (art historian and critic) Victoria Lu(musem consultant) Pooja Sood(Director of Khoj Foundation) and Xu Bing (artist). Korean artist Lim Taek’s work is inspired by 18th century traditional Korean black and white ink drawings. Tael transforms these into 3D sculptures made of plastic and Korean traditional paper which he installs in a gallery. He then photographs animals trees rocks and people and places these images into the installation. His intention is to create a dreamlike sensation for viewers as they gaze at his imaginary world. Japanese artist Maiko Suganowas nominated by Asia Art Archive. She is interested in bridging barriers and misunderstandings by seeking common ground across cultures. In 2002 Sugano was presented with the Jack and Gertrude Murphy Fine Arts Fellowship sponsored by San Francisco foundation. She also runs an artist residency house called ‘YomoYama House’. This work ‘Amorpha Juglandis’ is part of a series and drawings and embroideries in a project entitled ‘Paracelsus Garden’ – an imaginary location inhabited by insects and plants which on closer inspection reveal themselves to be a bizarre juxtaposition of bones muscles and organs. This work takes the form of a moth which uses the cochlear (part of the human inner ear) and scapulas(shoulder blades) as wings. The entire work is embroidered with fine polyester filament on silk. Noriko Yamaguchi was born in 1983 and her work crosses over the mediums of photography and performance art. In the ‘Ketai Girl’ series Yamaguchi wears a bodysuit made of cellphone keypads a comment on today’s society where people are in constant telephonic touch but ache for physical connection. In 2004 she received the Panel of Judges Award at the 21st Century Asia Design Competition held by Kyoto University of Art and Design. larger images and more information about all the artists see Sovereign website.